Before you prepare corn for canning, start with corn that has the husks on and the silk attached. This allows you to assess the corn’s freshness. Choose ears with brightly colored husks that are free of spots and moisture; silks should be golden, not matted or brown. Here’s a surefire way to select corn that is sure to be juicy and tender: Slightly peel back the husk to check for any pests. 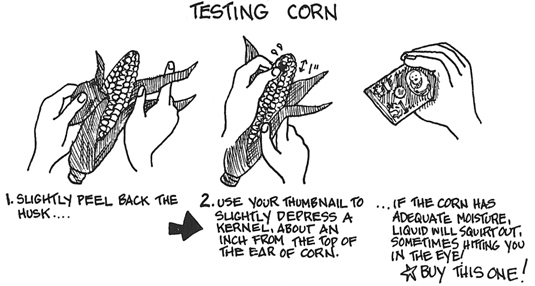 If all is clear (no bugs or mold), use your thumbnail to depress a kernel about an inch below the top of the corn. If the ear has adequate moisture, liquid will squirt out. How to test and select corn for canning. Canning and preserving low-acid foods — such as corn — requires pressure canning to kill microorganisms that are harmful if not destroyed before ingesting the food. 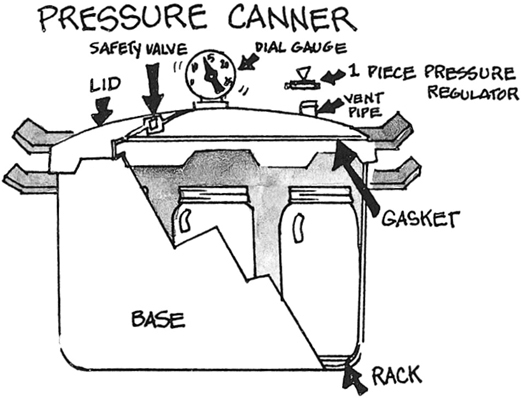 Pressure canning at 240 degrees kills the botulism bacteria. If this temperature isn’t achieved and the bacteria isn’t destroyed, one taste of this spoiled food can kill you. Simply boiling food on the stovetop will not kill any botulism and should not be considered a safety step. Canned corn is a staple in most people’s homes. Many don’t realize how easy it is to store this tasty vegetable. Remove the husk and silk from the corn. Using a sharp knife, slice the corn from the cob, measuring the corn as you go so that you know how many total pints or quarts of corn kernels you have. Meanwhile, bring 1 gallon of water to a boil in an 8-quart pot (you’ll use this as a reserve). Place the corn in a 12-quart pot. For each pint of corn, add 1 cup of boiling water; for each quart of corn, add 2 cups of boiling water. Place the pot over medium-high heat and bring to a simmer. Then reduce heat to medium and allow the corn to simmer for 5 minutes. Ladle the corn into your prepared jars and pour additional boiling water over it if necessary, leaving 1-inch headspace. Add 1 teaspoon salt to each quart jar or 1/2 teaspoon salt to each pint jar. Process the filled jars in a pressure canner at 10 pounds pressure for 55 minutes (pints) or 1 hour 25 minutes (quarts). Per 1/2-up serving: Calories 136 (From fat 15); Fat 2g (Saturated 0g); Cholesterol 0mg; Sodium 312mg; Carbohydrates 32g (Dietary fiber 3g); Protein 4g.